Click on the photo to see this photo in a Flickr album of how-to and archival photos monitoring progress of the garden. Or, click here to see the full album (overview of large thumbnail photos). The newest photos are at the end of the album (scroll down). The plants are doing great at the two-month mark. They are growing, putting out new flowers and saving a lot of water. There will be many more flowers in the future. SIPs are simply super. Don't just sit there. Get growing in them! Your plants will love you for doing it. Thanks to obstructionism in the trade, most Americans do not know about sub-irrigated planters (SIPs) or they may know them by the term "self-watering". It is bad English and even worse horticultural terminology. Sub-irrigation is in worldwide use in modern greenhouse growing. Fellow growers would crack up if you said that you had a self-watering greenhouse. Drench and drain hand watering is history for growers who want to stay in business. 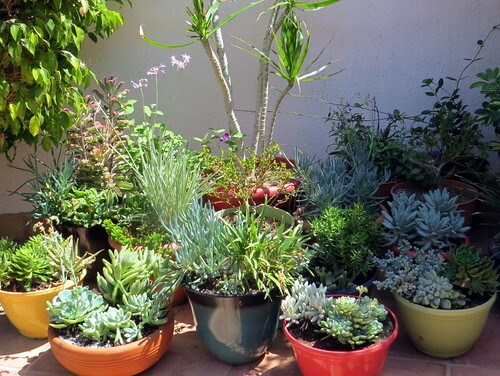 It may also be history for those who want their plants to live in the drought crisis. A utopian idea but maybe we should ban drain hole pots along with plastic bags. They create unjustified profit for growers based on needless consumption at the expense of society and the environment. On a brighter note, see that the Dracaena marginata leaf head that was damaged has grown new leaves and is almost back to normal. All of these Dracaena canes were on their way to the dumpster when I intercepted them. I rooted them directly in the SIP they are now growing in. Pretty neat...from trash to treasure as some say. Also, note that the property owner installed a wall hanging and had the Ficus trees pruned. There was an invasion of white flies. 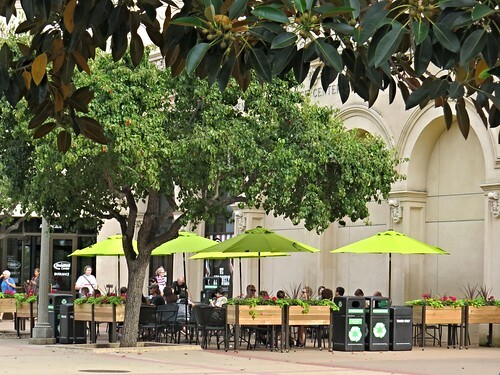 There are no pest problems with the SIP garden however. The owner graciously allowed me to store my plant lab while I get located. My plan is to create a much bigger test garden in a San Diego neighborhood. I am in the process of writing a proposal in the form of a private invitation only web site. Overhead view of a sub-irrigated planter (SIP) made from a green plastic tote box. Water/Oxygen reservoir(s) system made from recycled 1/2 gallon milk containers. An overflow drain tube connects from the top height of one of the milk containers (4") to the outside. NOTE: There are holes (large slots) in the bottoms of the milk containers. Water flows along the bottom of the tote box and rises to fill each of the reservoirs limited by the height of the overflow drain tube (4"). The water level can rise no higher than the overflow tube. The container bottom acts as a "connecting pipe". There is no need for connecting tubes or pipes between the milk containers. The spaces between the container reservoirs forms the soil wicking system. Planter mix should be firmly packed down in these spaces to create a well functioning wick system. Water will rise up into the root zone by capillary action. 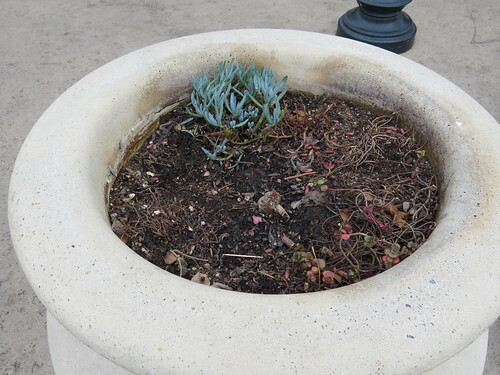 Note that for illustration purposes the planter is only partially filled with planter mix. Fill it all the way to the top rim before seeding or installing starter plants. See this prior post for other views and information. 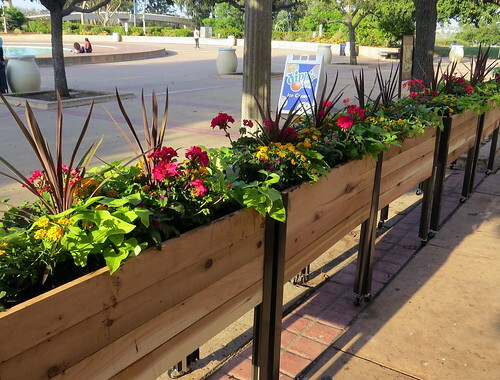 See this Flickr photo set for other planter bed & box SIPs. Photos of SIPs for growing plants indoors. See all of Greenscaper's Flickr photo sets. The function of the overflow drain hole in sub-irrigated planters continues to prompt questions. It may be that some think of it the same context as the drain hole in a traditional plant pot. They serve very different purposes. There are 3 functions of the overflow drain hole. 1. It is analogous to an LED red light warning when filling the reservoir. The first sign of water dripping from the overflow drain hole tube serves as an alert that the water/oxygen reservoir is full and to stop adding water. 2. It determines the height of the water level in the reservoir. No matter the physical height of the reservoir, water can go no higher than the height of the overflow drain hole. This appears to be the point of most confusion. 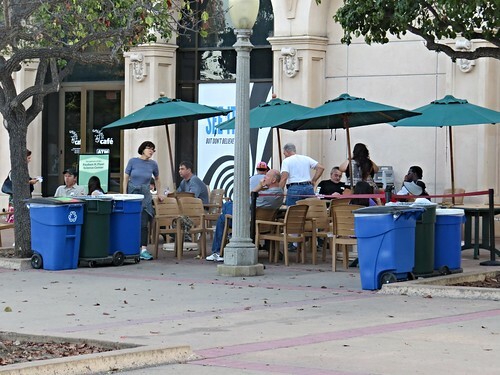 The water/oxygen reservoirs in the green tote box SIP (top photo) are recycled ½ gallon milk containers. They are 4” square; therefore, the physical height of the reservoir is 4”. The usual location of the overflow drain hole would be at the same height. The water level when full is then 4” or the same height as the physical reservoir in this case. Note that the water level will not remain full for very long. Within a matter of minutes, water will start rising by capillary action up into the soil and root zone. Photosynthesis will add to the lowering of the water. There will quickly be an air space at the top of the reservoir chamber(s). This oxygen supply is a poorly understood benefit of sub-irrigated planters (SIPs). It is arguably as important as the water supply. 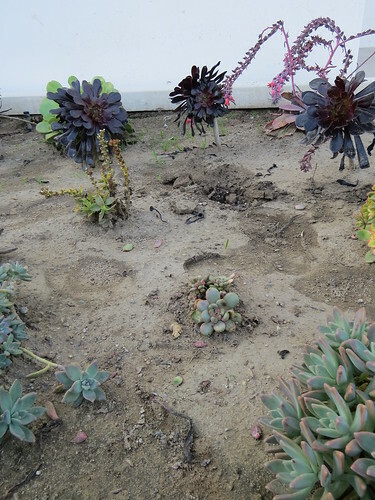 Lack of oxygen is a leading cause of poorly developed and dying plants, including those grown in the ground in poorly aerated soil. This is of course a common problem in the city where most of the soil is of poor quality (and often contaminated with toxic metals such as lead). If you position the overflow drain hole at 3”, you will have a 3” water level when full and a 1” layer of air inside each of the reservoir chambers. I would not do this but mention it only for illustration purposes. If you live in a very hot climate, you might want to experiment and expand the water holding capacity of the SIP by positioning the overflow drain hole at 5”. This could extend the period between refills. You should definitely product test this before converting multiple planters. You want to be sure that the extra high overflow is not causing over watering. When you fill the planter, you will have a 5” high water level, 4” of it in the reservoir and 1” of wet soil above. In a hot climate, this is probably of little consequence since the rate of photosynthesis and transpiration is very high. The 1” of very wet soil will dry down in a short time and there will be no root rot. 3. 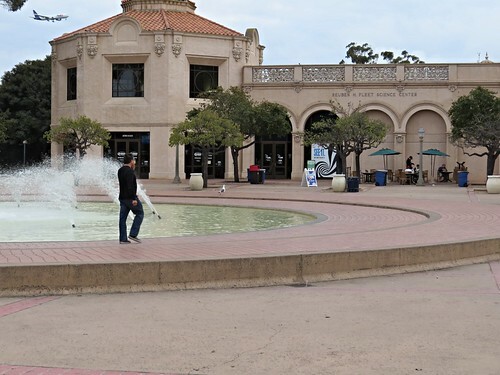 It serves as a conventional drain hole in the event of rain. The foliage canopy of the plants and plastic sheet mulch typically prevent much water from entering the planter but the overflow drain hole provides a system to drain excess water. 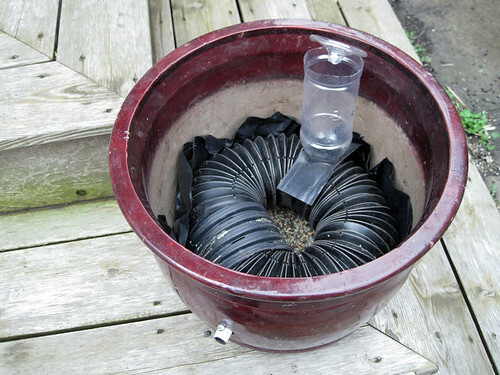 You can convert traditional drain hole pots to SIPs by using this simple method created by Johanne Daoust in Toronto. There is no need to plug the bottom drain hole or drill a hole for an overflow drain tube. It is a clever idea. Note that she used flexible corrugated drain pipe for the water/oxygen reservoir. 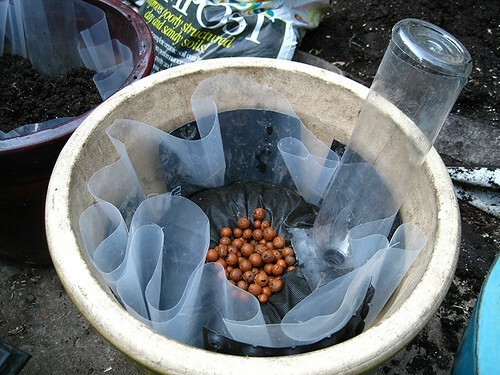 It would work just as well using a reservoir made from a recycled plastic food container(s). My firm belief is that the biggest potential for sub-irrigated growing is to convert the millions of traditional drain hole pots that are currently in use to sub-irrigated planters (SIPs - aka erroneously as "self-watering"). There is no real need to buy special "self-watering" planters. These photos are from Johanne Daoust's Flickr photo set. The first one shows her initial method of SIP conversion. It employs a water/oxygen reservoir, fill tube, plastic liner and overflow drain hole tube. The problem with this method is the need to drill a hole in the ceramic pot. This requires a carbide or diamond drill bit and is a laborious task if you are converting many pots. Johanne designed a very clever workaround that is easy to do and does not require a drill. The second photo explains the method. The reservoir at the bottom of the pot is covered with landscape fabric to prevent soil particles entering the reservoir and inhibits the roots from clogging it. To avoid leaks she also used heavier duty plastic in place of the thin sheet plastic used in the first version. The key feature, however, is the way she designed the overflow drainage. It is simple but effective and avoids the need for drilling. Instead of drilling through the sidewall of the pot, she simply made some holes in the sheet plastic at the height of the reservoir. To maintain a space for overflow drainage, she wedged some pieces of drainpipe between the plastic and wall of the pot. Overflow drainage will flow through this space down to the bottom of the pot and out the drain hole. Note that she refers to “weeping tile”. This is a name used in Canada for plastic corrugated drainpipe. My guess is that it originates from the fact that drainpipe was originally made from clay as in clay tile. Also disregard the clay pebbles at the bottom. They are not necessary and she did not use them when she planted the pots. 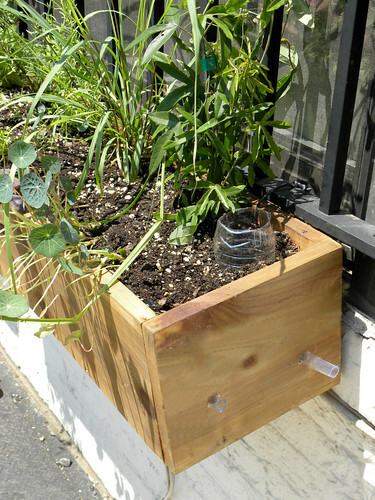 I will make and photograph a planter like this to further illustrate the method. This method appears to be a winner! We need many more growers like Johanne who create new ways to design SIPs that are simple but effective. Stay tuned. It struck me that this sub-irrigated portable mini garden made from recycled kitty litter buckets had a colorful and playful quality and thought it would make a neat kids garden. We have thousands of schools across the country that do not have school gardens. What they do have in abundance however is concrete, kids, and art and science teachers. Working with sub-irrigated planters (SIPs) like these who knows the creative designs that would come out of the minds of art and science teachers working together? These SIPs are science based but in my view have play dough and finger paint qualities. We could easily have very low cost but highly productive school gardens like this in every public, private and day care school in America. They would go a long way in solving our obesity, poor nutrition and hunger problems. Sub-irrigated planters (SIPs) also teach some good science and simple technology. In my experience, there is as much or more STEM (science, technology, engineering and mathematics) in gardens created from SIPs than there is in traditional dirt gardening. These DIY SIPs also teach recycling, and respect for the environment by saving water and eliminating runoff. To enhance plant science learning, it would be an easy matter to make clear walls on one side of some of the planters so that students could see the root system and capillary action at work. This could be done quite easily with clear Plexiglas and an adhesive like Goop. Drug store type hydrogen peroxide would take care of any algae growth. Another advantage of portable micro gardens is that the SIP components can go home with kids over the summer. A rules-based SIP “adoption” program solves the problem of summer recess maintenance and provides even more student learning opportunity. Kids can learn valuable personal self-sufficiency skills by growing food at home during summer vacation. What we need to make this happen are mainstream parents who are not dirt gardening ideologues to speak up. Currently we have too many misguided school administrators, teachers and gardening parents who think that “garden” and “growing” are synonyms for dirt. Many of them are hooked into thinking that grandiose greenhouse projects costing as much as $2 million dollars are necessary. For example, think Edible Schoolyards and Alice Waters. Expensive projects like these are a superfluous luxury in a down economy, with rising food prices and so many people unemployed. The real culprit behind this dilemma is our broken horticultural education system led largely by the USDA Extension Program and urban botanical gardens. I rarely find progressive information about modern food production methods from any of these institutions. Their comfort zone seems to be from a prior century when we were a rural society and all we knew was dirt farming and gardening. Those days are gone. We will continue to become increasingly urbanized with an even greater need for technology based food production. It is time to move forward not backwards to a bygone time of Victory Gardens in the dirt. Lao Tzu - "Give a Man a Fish, Feed Him For a Day. Teach a Man to Fish, Feed Him For a Lifetime"
This morning I shot a quick video showing how well my tomatoes and peppers are doing in this years batch of self watering containers. Near the end of the video I show how easy it is to fill the water reservoir that does NOT require a PVC or copper tube in order to add more water. We get little help from our horticultural and botanical institutions about modern urban food production methods but thanks to the Internet that does not stop this socially valuable information from spreading. "Garden diary" blogs like the following are a major help for all of us who would like to grow some fresh vegetables but do not have the land, time or interest in dirt gardening. This San Francisco Bay Area grower has made DIY sub-irrigated planters (SIPs) from tote boxes including the EarthTainer design by Ray Newstead. You can see the results in the blog photos and judge for yourself about the benefits of sub-irrigated portable micro-gardens. I have started a new tag titled “blogs to follow” and will add other blogs retroactively. There will be many more blogs added to this category. Perhaps one of them will by yours. Stay tuned. While our main crop are different varieties of tomatoes, we’re very excited about our first crop of zucchinis. The first blooms have turned into fruit…are zucchinis fruit or vegetable? Do they have seeds? Regardless, this brings back memories of when I played in my grandmother’s garden when I was little. She had rows of zucchini and various squashes. Rebecca is a fellow Brooklynite who is discovering personal food security by doing and learning from personal hands-on experience at little or no cost. She didn't need to read a bunch of gardening books, attend a workshop, grow a green thumb or join a group to do what she did. The information she needed is readily available online. Okay, so it's not a "garden" and it's not pretty but it is a productive sub-irrigated food growing system (SIP) and a simple learning tool for a neophyte food grower. This is not meant to be a decorative planter. It's plumbing similar to what’s concealed inside your kitchen cabinet. The SIP method works inside any watertight container. What you see here demonstrates that you do not need a plot of land or a traditional garden. There is obviously much more space on this roof but the garden can grow incrementally at Rebecca's own pace, one SIP at a time to suit her time and financial budgets. There are those who will nitpick the PVC pipe fill tube but it looks to me that she nailed the 2-utility bucket SIP method. Way to go Rebecca! This looks like a traditional raised bed planter but it is not! 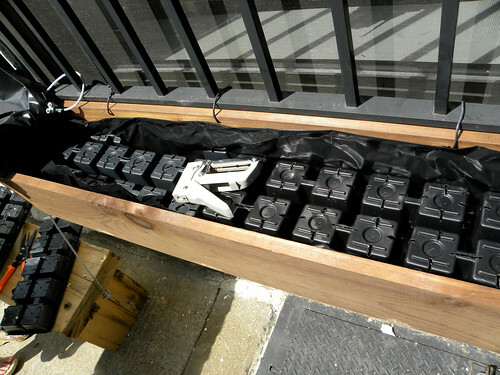 This portable micro garden (PMG) is equipped with a simple to make sub-irrigation system. It is far more effective and productive than a top watered raised bed. That includes those that are drip irrigated. Think of these PMG systems as intensive care units. They benefit from the best of two worlds. Nature provides the sunlight for photosynthesis and technology provides water and oxygen for the root system. All three are critically important for growing healthy plants and the production of abundant fresh food.